This post is updated and revised from a post I originally wrote 2 years ago as I feel it is very fitting for this time of year. You might think that someone in my line of work would have a serious infatuation with all types of storage containers… but in my case, you would be wrong. You see, I almost never buy storage containers. I’d be lying if I said that the enormous stacks of brightly colored, perfectly matching storage containers at all the local stores don’t make me drool just a little bit. I almost always walk a little slower past the storage container section, just to get a good look at all the amazing storage products available these days. But I almost never purchase anything… honestly! The last storage containers I purchased were for Simon’s nursery (before he was born — or over 2 years ago). 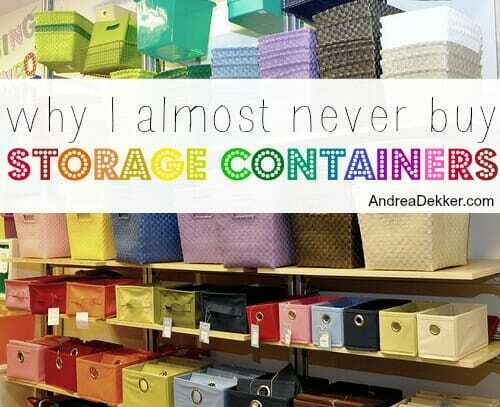 So how can I get by without purchasing more and more storage containers? 1. I don’t STORE a lot of stuff! This might sound kind of obvious, but since we don’t hang onto mass amounts of decorations, memorabilia, craft supplies, baby clothing, etc. we don’t need storage containers to store them in. By simply doing regular purges throughout the year, I’m able to maintain the stuff we have and do not need to purchase any more storage containers. In fact, I’ve actually been purging so much this past year that I have 3 or 4 completely empty storage containers sitting in our basement right now! In my opinion, it’s just a better use of time and money to take a few minutes to purge than to take an hour to drive to the store, buy a new container, only to realize that container won’t work for your project anyway. 2. I make due with what I already have on hand. This one is HUGE for me — because although I’d love to just hop on over to Target every single time I want to store something, I don’t. With the various baskets, trays, diaper boxes, etc. that we already have lying around our house, it’s extremely rare that I can NOT find a suitable storage solution already sitting around our house. Although I haven’t actually purchased storage containers in years, I do definitely still use a variety of storage containers in and around our house. Most of our storage containers are boxes, baskets, or bins that we’ve accumulated (for free) over the years — other containers were specifically purchased for various storage needs in and around our home. Back when we lived at our first house, we purchased these really heavy-duty metal shelving units from Menard’s. At the time, I worried that we were spending too much — but based on how much we’ve used them over the years (and how sturdy they are) I would definitely say it was a quality purchase, and would highly recommend them to anyone looking for an extremely customizable, durable, and sturdy storage shelving unit. After we decided on the best configuration of the shelves, I measured how much space we had between shelves and also how much stuff we needed to store. Then (and only then) did I head to the store to find the perfect storage tubs for our needs. Since I was buying them at the beginning of a new year and EVERYTHING was on sale, I decided to get all matching tubs for a cleaner look — and I opted for clear just so I could see what was inside — but I don’t necessarily think clear containers are best. I love that the Sterlite containers are true rectangles (not curved around the edges). I also love that they actually have a latch to close them — so they don’t accidentally pop open if they are bumped or nudged. These containers are definitely my go-to organizing containers for our basement storage needs — mainly because they aren’t too expensive, they are the perfect fit for our shelving unit, and they keep everything clean and dry. I’ve gotten SO many wicker baskets as gifts over the years — often, they are the just the “wrapping” for the gift, not the actual gift. 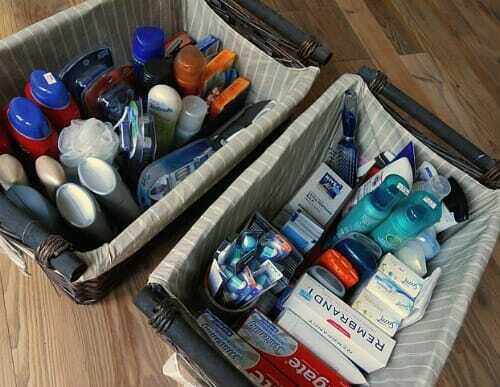 I usually donate most of these baskets — but I do save some of the smaller to medium size baskets that are rectangular or square in shape. They are perfect for office supplies, craft supplies, toys, toiletries, etc. etc. and they look really nice sitting out. One of the things I hate most about buying storage containers is that they take up SO much room when you’re not using them. Even in my house (as someone who tries really hard not to accumulate stuff) I have a handful of empty storage tubs, baskets, and boxes that I’m not using. It IS nice to have this on hand for future projects — but in the meantime, they are taking up a bunch of space in our small storage closet upstairs. 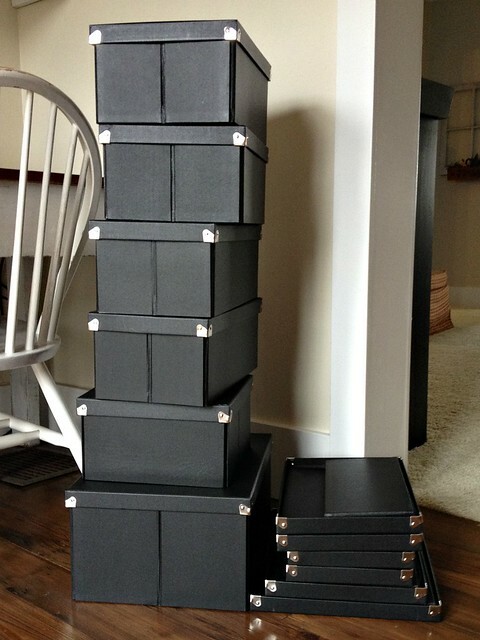 I’ve always liked the idea of collapsable storage containers… but I never found any I liked until a couple of years ago. 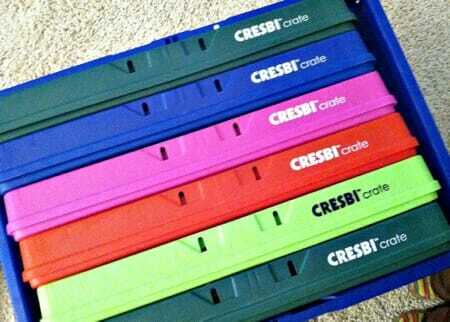 The Cresbi Crates are technically for carting groceries around, but we use them to store toys as they are the perfect fit for our little toy cabinet upstairs. I also like the Pop ‘n Store collapsible boxes for storing DVDs, cards, chords, memorabilia, craft supplies, batteries, etc. I also like that they have lids and stack really nicely. If you come to my house, you will find shoe boxes and/or diaper boxes used as organizational tools in almost every room of our house. We have shoe boxes in our sock drawers (for socks of course! ), in our office to organize envelopes and small pads of paper, in our bathroom for extra toiletries, and even in our freezer to stack bags of cheese, baking supplies, frozen veggies, chocolate chips, etc. I use diaper boxes to corral toys, as donation boxes in the bottoms of our closets, to organize gift wrapping supplies, and so much more. 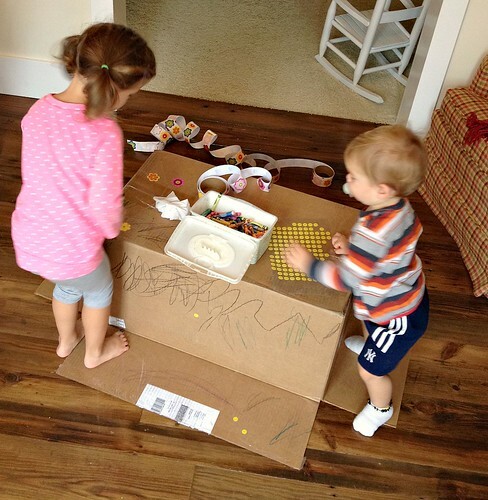 And if worse comes to worse, cover the diaper box with paper (or use any delivery box) for a fun child-friendly art project! So if you’ve read my post, purged some of your things, searched your home for other containers, and are still convinced that you must purchase some new storage containers… here are a few things to think about before you do. 1. Don’t buy anything until you’re FINISHED purging, sorting, and organizing. 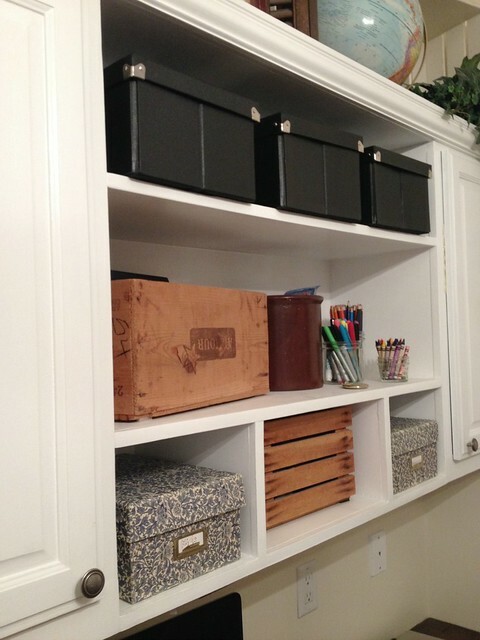 There is really no way you can know what type of storage container(s) you need until you are completely finished with your organizing project. So even if you are half-way through and know you don’t have any suitable containers in your home… just wait! Resist that urge to run to the store and purchase those shiny new containers. 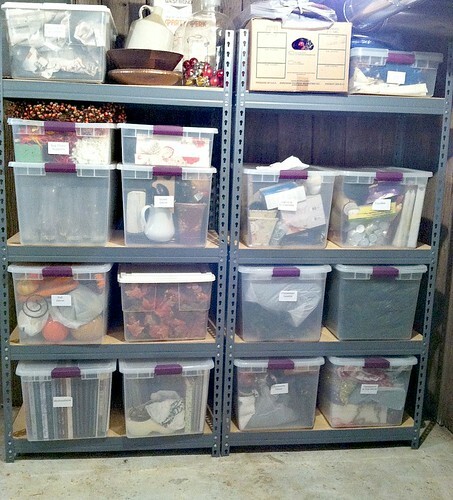 It’s amazing how your storage needs change as you go through an organizing project. Who knows, you might end up purging more than you think — which means you might not need to buy any storage containers after all! Unless I’m storing soup, I will almost ALWAYS opt for a square or rectangle container versus round or oval. They stack better, they store more, and they waste much less space overall. 3. Make sure you know the dimensions of the containers you need BEFORE you go to the store. Seriously, you will save yourself SOOO much time, energy, and money by knowing exactly what you need before you head to the store. Don’t just walk in aimlessly and pick the container you THINK will work — or the one you are most visually attracted too. Your storage containers should work for you — not the other way around! Basically, my best advice for buying storage containers is “don’t do it”! I’m not trying to be silly or cheap either! I’ve witnessed time and time again that we can most likely get by with something we already have on hand… or we can do a little purging to make everything fit once again. 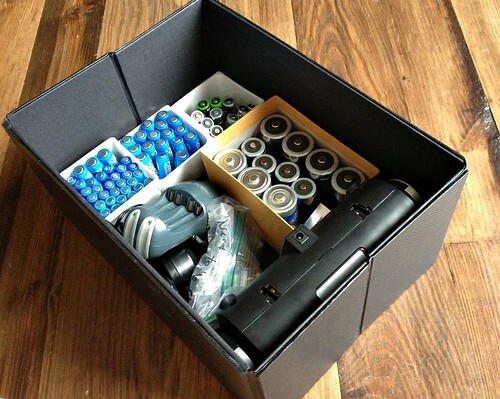 What are your thoughts on storage containers? For jewelry lovers, sellers and makers, this plastic bin transformation is for you. Necklaces and bracelets often get into a tangled mess on a day-to-day base. It’s almost impossible to untangle the cluster of chains when it comes to traveling from place to place. This jewelry transporter will help you stay organize and tangle-free. Drill a few holes on the side and insert metal pegboard hooks. Decorate your jewelry transporter on the outside using colorful duct tape, cloth or tissue paper! I have just read this article and you are right we can get way to carried away with fancy coloured storage solutions to ‘seem’ organised but really we still have no clue which box we have put the stuff in! It is a nightmare and can cost a fortune! I must admit I am a fan of just putting things in draws, surely that’s what they are for anyway. However since working for a plastic box company, I must admit tote boxes are particularly useful when moving house or storing things up-the-loft. They look rather simple but have label holders (for labelling!) and one of the key advantages of these tote boxes is that they stack for efficient distribution and nest to save space when not being used. There are actually really useful! I am a new subscriber and I have enjoyed reading many of your posts. I am from Perú (Southamerica) and I am in the process of organizing and purging my house. 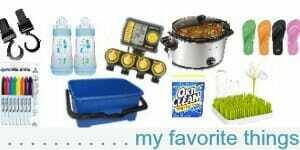 Your recomendations are great and are helping me to unclutter my home. Congratulations for your blog and keep sharing your life and tips!! Yay! Welcome to the blog — so glad to have you reading!! The last line is the best. “Just don’t”! I also use what I have hanging around and shoe boxes are great in drawers. I use them to hold my music cd’s and I use the lids in a shallow drawer for my jewelry. It doesn’t matter what they look like ’cause they’re in a drawer! So anyway, I haven’t checked Target, but I just wanted to let it be known that if someone wants the square ones, check Publix if you don’t want to order them on Amazon. And if you can wait till after Christmas you might get a great deal! Thanks for the tips Diana! We don’t have Publix around here, but I’ll take your word for it! One of the best posts I have read so far! This had me to start thinking about all the containers I have that the kids have not opened in a while just taking up room. This gave me the motivation I needed to “PURGE” instead of store. I often find myself overwhelmed with 4 kids and just go container crazy. I can see that I need to back off the containers and just keep to the necessities! Do you have any posts related to your purging tips. What to keep, what not to keep? Any other tricks like the diaper box in the bottom of the closet to collect donations? Thanks so much Sonya! Purging can be overwhelming (especially with little kids running around) but it is SO worth it when you have less stuff to clean up, clean around, store, organized, etc! I love this post!! I’m the same way about the organizing aisles at the store. I just walk down them and daydream a little, but then I look at the price tags. It can be so expensive! 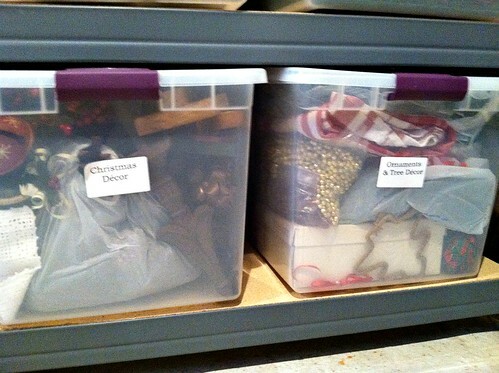 Usually after I purge, I realize I don’t even need the amount of storage bins I was using in the first place! While I definitely think well-planned storage containers can do a lot for a space, I mostly feel like they are not nearly as necessary as many people think. It’s amazing what you can do with a shoebox and some good purging! I like to buy ice cream with the re-sealable lids. While this is generally more expensive (but on sale quite a bit during the year) I have found a second use for the empty container. I don’t have a garbage disposal in my home so I use the ice cream container for food scraps that need to go in the trash. Put them in the container, put the lid on top (I mark a black “x” on it) and pop back into the freezer until full. By keeping it in the freezer I can get maximum use out of it and also the food scraps don’t smell during warm months. We also buy the big plastic tubs of icecream for similar reasons! Our kids LOVE using the buckets outside, in the water, in the sand, inside to stash smaller toys, etc. I read this 2 years ago and agreed then. But over the last two years I have learned I didn’t fully understand this post because I have a different problem. I am so cheap, I don’t want to waste money on containers, so I just don’t contain….That is not your concept here. So I am starting to have a love for containers. Whether that is shoe boxes or fancy storage boxes, they are still necessary. I finally fully agree with your concept because you are not stating we don’t need storage and containers, just not fancy storage. And that purging must come before storing. 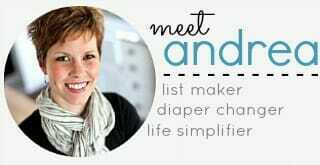 And as Noni says in her blog, if after organizing you bring something else home it has to fit in the container or it or something else must go to make room for the new item. So now take a family of 6 in a 1100 sqft home……and I have a lot more purging to do to contain us in our home. Our home is our container and I must fit us in that container. 🙂 Even if I think a larger home would be a better container, I need to make this one work for us right now. And I can’t purge people 🙂 so stuff it is. 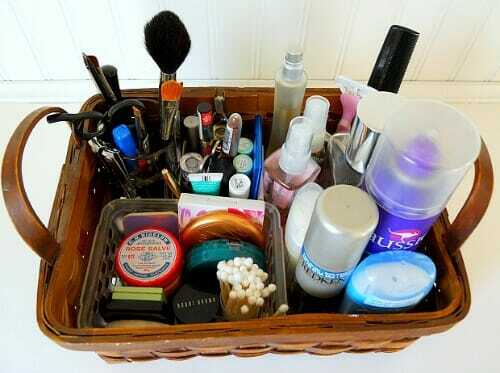 And the containers I use don’t have to be pretty, but proper containers will allow better use of my little space. Thanks for that link Stephanie! And yes, I agree with everything you said in your comment — very well put! Thanks for your helpful tips! Great post Andrea…I’ve been working on a system of containers that would replace ordinary plastic food storage containers with a uniquely designed system of containers and racks, and I thought it would make sense to share it here. 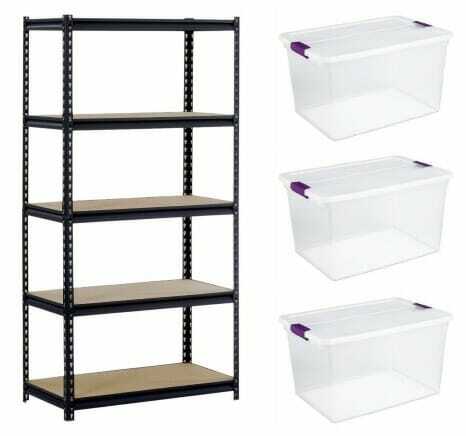 I used to have the mindset that I needed to buy nice storage containers so that I would really like them and use them. When I would look into buying some I would get upset about either not finding exactly what I want or seeing a ridiculous price tag. 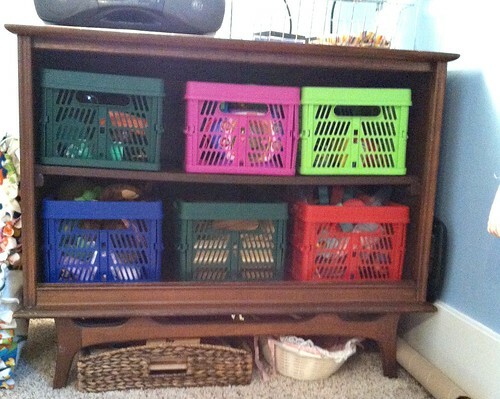 I have seen many DIY posts with simple tutorials for making your own storage containers from used boxes, baskets, etc. You can spray paint, cover with paper or fabric, and even add handles or embellishments if you want. You can have the best of both worlds–frugal storage and good looking and matching. You have such great willpower! Storage containers are my weakness – especially if they’re cute and on sale. Love your ideas. 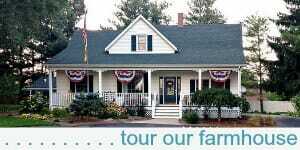 I posted a link on my blog. Thanks. Thank you for keeping your organizational skills practical and easy (and affordable) as always. There are so many sites that set the bar so high for organizing – pretty containers as a must, labels on everything (and I mean literally everything). Love your practical and achievable approaches. You and I share pretty much the exact philosophy on storage containers especially the part about not buying them until you’ve purged and sorted and figured out exactly what you really need to contain! Great post! Since purging alot of our belongings during our recent move, I’ve been able to consolidate many things into smaller or fewer containers and ended up with an inventory of empty containers I already have. I store them in our laundry room and have “shopped” them many times to store or reorganize what we currently have! I love not having to buy anymore. 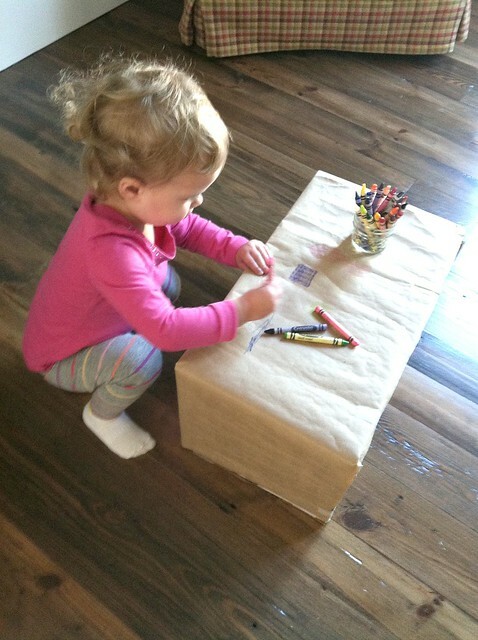 Plus another great storage container, especially for small items/toy, is empty wipes boxes. We use them for storing my son’s small Lego models with the picture of the model taped outside the box. We have another box for “random” toys which are the small plastic toys my kids come home with from school/parties/kids’ meals. I let them keep whatever they want until the box is full, then tell them they have to get rid of what some whenever they get new things. Thank you for this post Andrea. I love it that you always look for the frugal way to do things! Not too long ago I was looking for a nice box to display our Puffs tissues in. (The type that lay flat in the box.) We remodeled our bathroom and I just didn’t like the colors of the boxes that were available. What I found when I was looking for a refillable box was that there weren’t many choices and they were $20 or more! I just didn’t want to spend that much money, especially when I couldn’t find exactly the color I was looking for. Call me frugal, a cheapskate, or just plain cheap, but I found a solution to my tissue issue! I took a box of Puffs, emptied it out, grabbed 2 colors of spray paint, and sprayed the box. It was a bit cold outside when I did it, so the colors made a wavelike texture on the box. Turns out the box looked marbled when it dried, and the colors matched my decor exactly! When I want to change it up a bit, I’ll just take another can of spray paint to my tissue box. I agree that lovely storage containers and bins can be so tempting….but usually not so much after I look at the price! Because of that, I usually just make do. 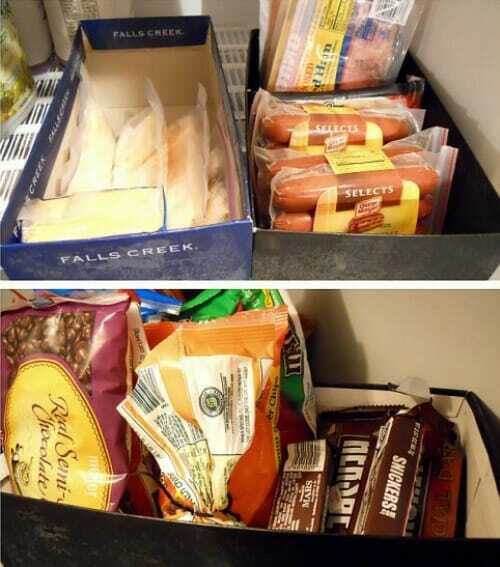 : ) But, I will say that Dollar Tree can be really nice for saving $ on storage containers. They don’t have anything as big is your 66 qt. boxes, but I’ve gotten plastic bins that look kind of like your fabric floral ones there. Granted, I doubt they’ll last as long, but for only $1 each, I think they’re great. The thing about Dollar Tree is that some things are a great deal, but others things are totally cheap and not even worth $1. Thanks for the reminder to purge, purge, purge! I agree with the other comments! This is why I am a huge fan of your blog. I love how you encourage others while not sending them out to go into debt. Teaching simplicity in all you do. This is why I also encourage and show my collage age daughter your blog all the time. I want her to be smart in life like you and your husband are. Thanks Debbie — I’ve seen time and time and time again that purchasing new storage containers really just isn’t necessary (or a good use of resources). 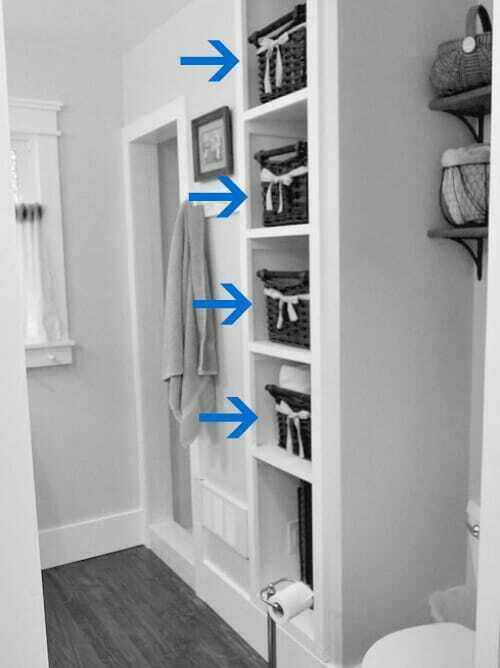 There is almost always something we can use around our house that will work perfectly fine — saving me time and money in the process! Amen. PURGING is the key to keeping my small home organized. The comment about storing soup made me laugh. I almost always buy square containers to use all the space… but for soup I like them round. Especially since I take lunch to work, I feel like eating from a round container makes me feel I am eating from an actual bowl. 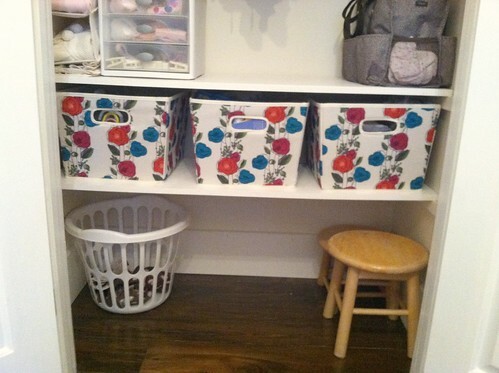 I agree with your advice to first purge, sort, and organize before deciding to purchase a new storage container because that not only saves you from unnecessary spending, it also helps keep everything organized and might even provide an opportunity to donate things you don’t need to people who do! This is another great post from one of my favorite bloggers! Andrea, I feel like I’m getting to know you so well that I can “predict” some of what you might say in a blog just by reading the title. I also try to look around the house for storage options before buying. I will say that having the Dollar Store around the corner saves me money when I do decide I need to buy a container. I love to see different sides of a topic. When I saw the blog post pop up on my reading list, I immediately clicked on it. I love beautiful storage containers, but I try not to go overboard. I make sure (like you stated) that I am going to be able to use the container 10 years from now before I purchase it. Believe me, when I walk down some of the aisles, my impulse is to place all of the beautifully printed boxes in my basket and not think twice about it. But, I NEVER do. That chevron basket looks really cute and I may really want it (at the time), but is that print really going to be in style two years from now? It would look awesome on a blog post, but is it really practical for me to purchase? So, I may splurge (and when I say splurge, I mean a $20 splurge) on a woven basket that I know I need to store something that is going to be displayed, but I try to limit my container purchases. Of organizing blogs put too much emphasis on pretty containers and labels. Don’t get me wrong…I enjoy looking at all of that, especially on Pinterest, but its not a necessity and I really appreciate your perspective on organizing. Thanks Jessica, I’ve always been adamant that organization should not be complicated or expensive — and buying storage containers is one of the things I rarely ever encourage anyone to do (at least not right away).